We are making our independently-assessed evaluation Certificates for printers and copiers available for FREE download. They are the products of our independent and objective lab for digital printing equipment. We are publishing our Certificates for FREE (so you can display them in your showrooms) along with the Rosettes (in jpg format so you can include them in your marketing material). 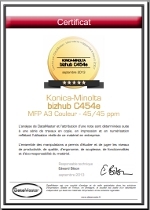 Our Certificates are based on a complex scoring system and carry up to five stars. We have decided not to publish those with less than four stars. From our decades of experience of the market and from testing the machines of every brand we can tell you there have NEVER been more differences between machines than there is at present! These tests are designed to reflect the real world in which business hard-copy output machines are to be found. The DataMaster Test Suite goes much further than simply testing the speed of a machine against the spec for A4! Days and weeks of analysis can be summarized in the simplest graphical format – and this is why DataMaster’s Certificates and, Rosettes are fast becoming the basis for Machine and Solutions selection around the world. For more information on our Tests, click here.